Last week we traveled to Manchester to see a concert. Any guesses on who performed? This entry was posted in Travel Photos and tagged 50 Year Project, Concerts, England, Life, Manchester, Music, Photography, Travel Blog, Travel Journal. Bookmark the permalink. I bet it was Pearl Jam. Rock on! Pearl Jam…they are a fave in our household. I can’t tell!!! Who is it? I’m so excited for this weekend because I’m going to a concert with my best friend at a place called Kelso Beach, about an hour north of here. You pay one price ($59), and you get to see about 8 Canadian bands from noon until around 11 at night. The two I’m looking forward to the most are The Trews and Three Days Grace. Have you ever heard of either of them? I haven’t heard of them (at least the names don’t ring a bell), but that isn’t unusual for me. The better half is the music lover and makes sure I get my daily fill. I enjoy music, but will forget about it when busy with books and writing. Your plan sounds like a lot of fun. Hopefully you will share some photos for the rest of us. Happy listening and dancing (if your like to dance). I will try and take lots of pictures, but it will only be with my little point and shoot because they don’t let you take in anything that looks like a professional camera. And yes, I will be singing and dancing and probably scaring everyone there!! My hubby is staying home because he’s a wimp and only likes country music LOL!!! Hey now, I like country music as well. Hmmm…I’m thinking I would get along with this Mike character. Can’t wait to see the photos and have fun!!!! Ummm….. no? I feel like I should though! 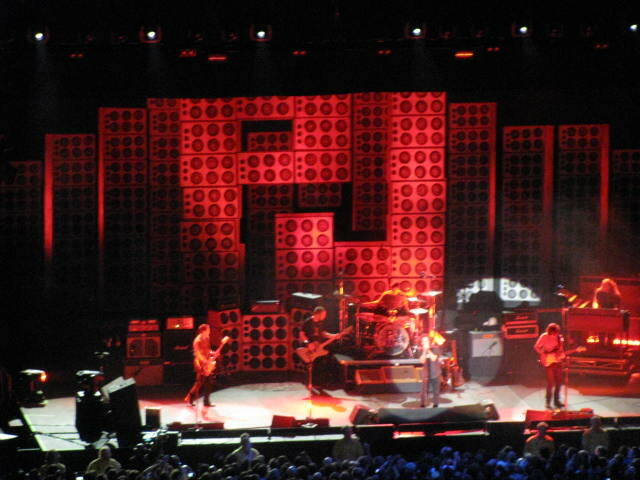 Pearl Jam…You can see PJ in lights behind the band. It was a great night…and you aren’t an old fogey! Sooooo cool! I haven’t been to a concert in ages. I have a few more this summer and I’m really looking forward to them. The crowds are always so energetic and fun.